Every now and then a cycle manufacturer introduced an innovation on their cycles that served no essential purpose other than aesthetic pleasure. As the years progressed, most companies found it necessary to consider the financial implications of unnecessary improvements. But the Triumph Cycle Co had always followed their own lead in cycle production, and the company was Great Britain’s largest motorcycle manufacturer. 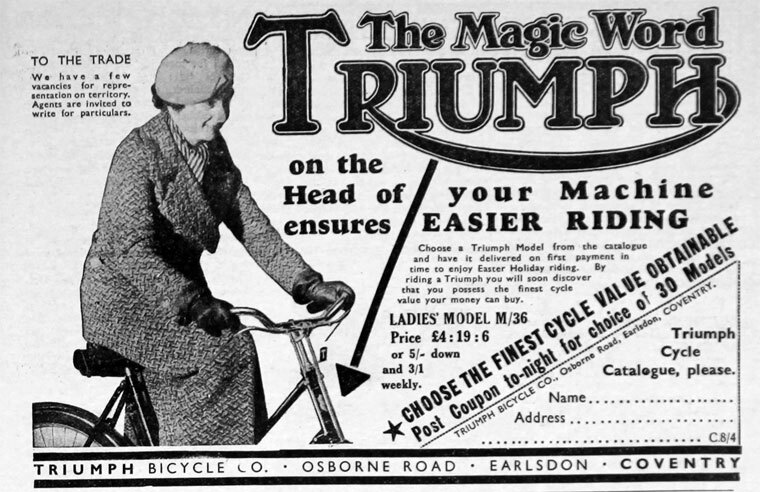 I can imagine a member of their design team observing the amazing new features that had started appearing on American bicycles by the mid-thirties, and proposing to the Triumph managers that the Triumph range might incorporate new design features themselves. Perhaps, after some discussion, a compromise may have been reached, with the company settling on new brakes and a totally over-the-top chrome fork crown that was unlike any other I’ve seen on any bicycle…? If customisers had been active in Great Britain as they were in the USA, a 1937 Triumph fork crown would have been the fork crown of choice.